January 1 - More stringent emission control regulations governing locomotive exhaust in the United States come into effect. January 1 - The Zentralbahn, in Switzerland, is created through the merger of the Luzern-Stans-Engelberg-Bahn (LSE) and the Brünigbahn. January 6 - A Norfolk Southern train carrying a few carloads of hazardous materials (including chlorine gas) collides with a parked train in Graniteville, South Carolina, causing the Graniteville train disaster. January 8 - Etxebarri, the furthest eastern point, and Sestao stations on Metro Bilbao in Spain open. January 12 - General Motors officially announces its intent to sell its locomotive manufacturing unit, the Electro-Motive Division, to a consortium of Greenbriar Equity Group and Berkshire Partners. January 24 - Burlington Northern and Santa Fe Railway introduces a new corporate logo that replaces the railroad's verbose name with BNSF Railway. January 27 - The United States federal government announces that it will not provide money for a $400 million extension to the Las Vegas Monorail system in Nevada. February 2 - The Las Vegas Monorail system is shut down due to problems with the electrical system; it is reopened 12 hours later after the replacement of a 30-foot (9.14 m) section of the power rail. February 14 - The San Diego Electric Railway Association in California salvages the body shell of car 357 (formerly of the Bellingham, Washington, streetcar system) from a Centre City San Diego restaurant site where it had been used as a "dining room" since 1972. March 7 - Amtrak discontinues the Three Rivers passenger train service between New York City and Chicago via Pittsburgh, Pennsylvania. March 16 - The Sentosa Monorail in Singapore closes. 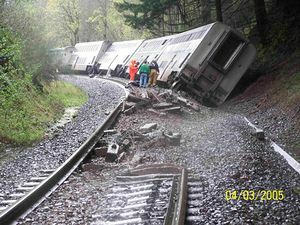 April 3 - Westbound Amtrak train 27 from Pasco, Washington, to Portland, Oregon, derails on a curve near Home Valley, Washington, due to worn rail seats; 30 passengers are treated for injuries. Aerial view of the CN collision, July 10. July 10 - A northbound Canadian National Railway train on the former Illinois Central Yazoo Subdivision runs past a red signal and collides with a southbound train. 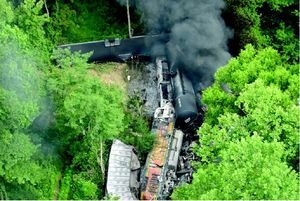 About 15,000 gallons of fuel spill from the locomotives, providing fuel for a fire that burned more than 15 hours; all head-end crewmembers on both trains die in the accident. September 15 - The conductor of Union Pacific Railroad freight train in Shepherd, Texas, leaves his switch keys behind in a switch control, leaving the switch aligned for the siding holding a parked train, causing the next train to come by to enter the siding and collide with the standing train, killing the engineer of the second train. Metra derailment, September 17. The arrow indicates the direction of travel prior to the derailment. September 17 - A Metra train in push mode from Joliet toChicago traveling at 69 mph derails as it traverses a crossover rated at 10 mph; two passengers are killed in the accident and more than 100 others are injured. October 5 - A Union Pacific Railroad maintenance of way employee who was walking back to a tamper to continue his work near Laramie, Wyoming, is struck and killed by a westbound train traveling at 40 mph; a subsequent NTSB investigation shows the accident to be the result of an agreement between the operating and maintenance departments on the required notifications to maintenance personnel when trains are operating near them and also a result of the maintenance employee not walking at a safe distance from the track. Aerial view of UP collision, October 15. October 15 - A westbound Union Pacific Railroad freight train collides with a standing freight train in the Texarkana, Arkansas, classification yard; a tank car carrying propylene is ruptured and the gas ignites, forcing the evacuation of about 3,000 residents within a 1-mile radius of the accident. Construction is completed on the Qingzang railway in China between Golmud and Lhasa, Tibet. Pacific National, who had taken over commercial running of the TasRail network, closed the Derwent Valley Line west of New Norfolk, in effect closing the Derwent Valley Railway. Bridge 67 on the former Lynton and Barnstaple Railway is reopened. ↑ Railroad Accident Report: Collision of Norfolk Southern Freight Train 192 With Standing Norfolk Southern Local Train P22 With Subsequent Hazardous Materials Release at Graniteville, South Carolina, January 6, 2005. United States National Transportation Safety Board. Retrieved on 2008-01-07. ↑ General Motors (2005-01-12). GM Agrees To Sell Electro-Motive Division. Press release. Retrieved on 2008-01-11. ↑ Railroad Accident Brief: Derailment of Amtrak Passenger Train No. 27, Home Valley, Washington, April 3, 2005. United States National Transportation Safety Board (2006-08-18). Retrieved on 2008-01-06. ↑ Railroad Accident Report: Collision of Two CN Freight Trains, Anding, Mississippi, July 10, 2005. United States National Transportation Safety Board. Retrieved on 2008-01-06. ↑ Railroad Accident Brief: Collision of Two Union Pacific Railroad Trains, Shepherd, Texas, September 15, 2005. United States National Transportation Safety Board (2006-05-22). Retrieved on 2008-01-07. ↑ Railroad Accident Brief: Derailment of Northeast Illinois Regional Commuter Railroad Corporation (Metra) Train 504, Chicago, Illinois, September 17, 2005. United States National Transportation Safety Board (2006-12-21). Retrieved on 2008-01-06. ↑ Railroad Accident Brief: UP Train Strikes Railroad Employee Near Laramie, Wyoming, October 5, 2005. United States National Transportation Safety Board. Retrieved on 2008-01-06. ↑ Railroad Accident Brief: Collision of Two Union Pacific Railroad Freight Trains, Texarkana, Arkansas, October 15, 2005. United States National Transportation Safety Board (2006-10-17). Retrieved on 2008-01-06. This page was last edited on 28 January 2012, at 01:47.